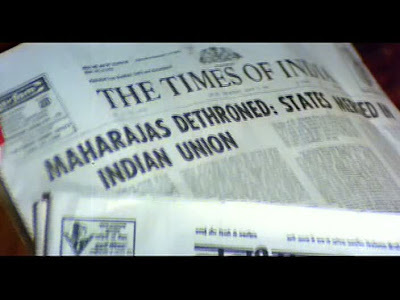 A huge and well-balanced cast, allusions to past dishonors and future troubles, inter-familial conflict, divided loyalties, star-crossed lovers, and plenty of horses and guns make this film a proud citizen of the Independent and Hot-Blooded Kingdom of Epics, a seldom-visited territory adjacent to, and with important historical and cultural ties to, Masala Pradesh, its much larger and louder neighbor. This DVD very frustratingly does not include any credits, so I don't know whom to applaud for the solid and careful writing that built this pretty and interesting film. Vijay Anand directed, and, as would be expected, his colors of filmified rural Rajasthan make the story's loss and fear go down more easily. 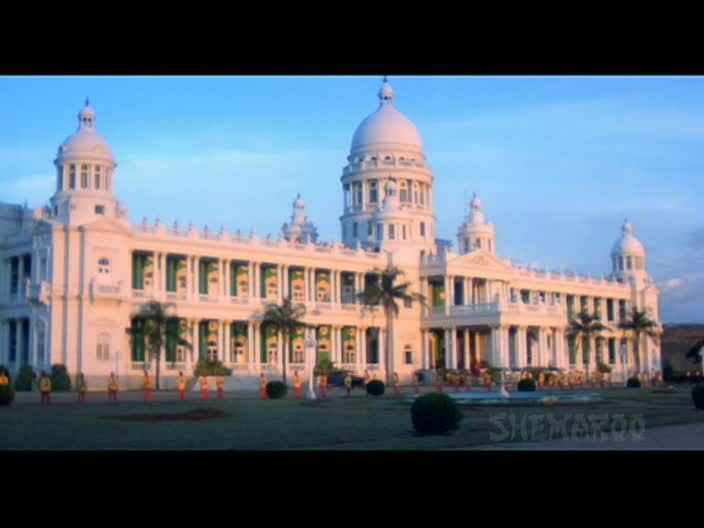 The eagle-eyed among you may recognize this palace as the British HQ in Mard and is in fact a hotel I stayed in in Mysore. embodied for most of the story by Ranjeet. (Because everyone in this film's last name is Singh and there are so many characters, I'm going to call the them by the actors' names instead.) Ranjeet's father Murad has just a few lines as the film begins, warning Ranjeet and the younger generation of the futility of their fight against amalgamation into mainstream Indian society (and perhaps formal governance, though that aspect was not clear to me). It's a battle he himself cannot bear to continue, and the sound of a gunshot brings everyone running to this hideous, copiously-lit throne room, where he is slumped dead, the evidence of the sweep of history slipped from his hand. As will surprise none of you, Ranjeet is not about to let power slip from his hands, and his nattily-attired goons terrorize the local farmers. Who is this actor? He has quite the mustache! Among the happy-but-not-for-long families are Iftekhar, Purnima, and their son Rajesh Khanna, a policeman. (Though it has little to do with the plot, I would be remiss if I did not point out that this is the jolliest I have ever seen Iftekhar. He actually laughs in this film - and not wry police inspector chuckles, either. See it for that if nothing else.) Iftekhar is old friends with Rehman, and both men hope that his daughter (Hema Malini) and Rajesh will get hitched, making them true family. Unfortunately, Hema loves Dharmendra. Their love is secret because her aunt, Indrani Mukherjee, long ago married Dharmendra's uncle against family wishes, and Rehman has refused to acknowledge Indrani (who is his sister) ever since. 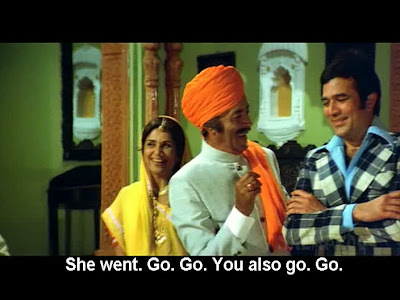 I was actually relieved when this plot thread appeared - my brain does not know how to compute a film in which both Hema and Dharmendra are major characters but not romantically involved. 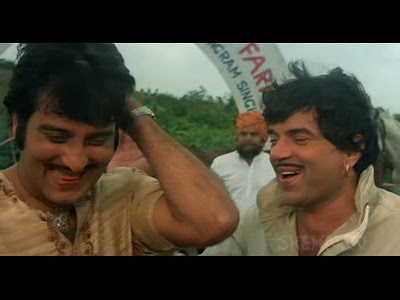 Dharmendra is the older son of Om Shivpuri, who shares Rehman's distaste for Indrani's marriage into his family. The younger son is Vinod Khanna, and here I will announce that I think Dharmendra and Vinod are my new favorite jodi. Look at them reveling in bhai-bhai pyaaaaaar! Shahrukh Is Love and I have started calling them WAPOH! (This formally stands for "what a pair of hotties," but if you say it correctly, the term expresses the sounds of the explosion of awesomeness that occurs when they appear together). and both couples share a beautiful Holi song, "Bhagi Re Bhagi Brij Bala." 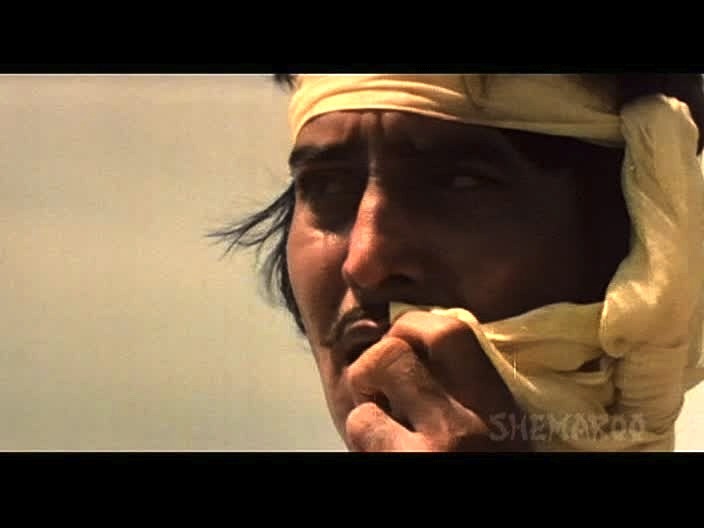 I'd never seen this song in any of the dozens of Holi playlists that pop up every year, and I don't know why, because it's a great song and a lively and colorful picturization, made even better by Vinod Khanna skipping around merrily and romantically, something I personally have seen tragically little of. But that's as happy as it gets. 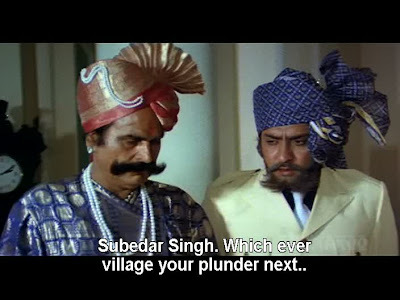 The film advances about ten years into the future, in which time Ranjeet has managed to ruin both brothers' romances and oppress and terrify all the surrounding villages. From that description, this could be almost any other film full of cackling villains and heroes galloping around to save their heroines. However, Rajput is more than that. All events and responses in the story are couched in the idea laid out by Murad in the beginning: this is an old culture being forced by outside pressures to adapt to new ways. 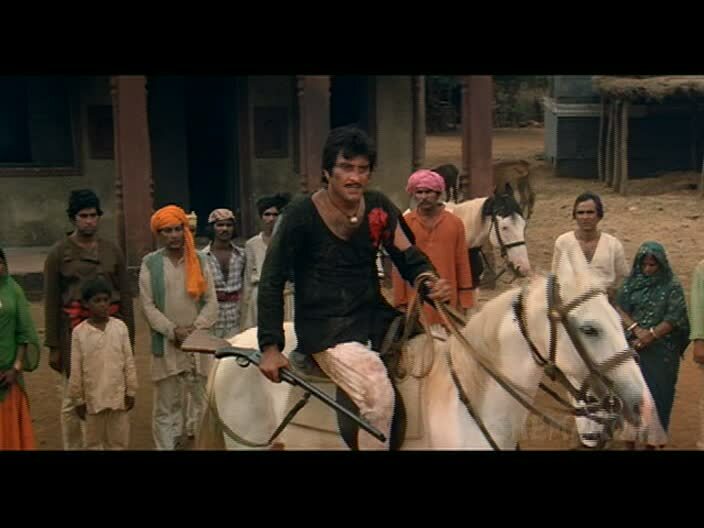 And this being filmified Rajasthan, there's a lot of language about honor, oaths, and identity that runs in the blood, amped up into dacoit-y fierceness with plenty of horses, rifles, and kidnapping. Whoever wrote this very cleverly broke apart some of these ideas and spread them across different characters, so you're never totally overwhelmed by any one person's goody-goody-ness and each of the heroes has a slightly different flavor very suited to the actor embodying it. 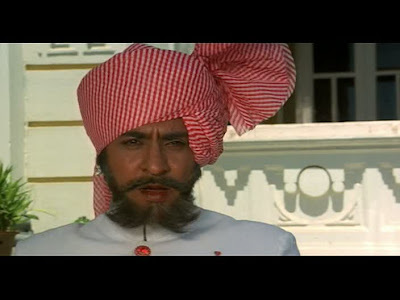 Rajesh Khanna is law, order, and the good things that come from adjusting to larger Indian society. You can see it in his costumes: he's still a Rajput, but he also wears western-style suits and ties, as well as the khaki of the outsiders' version of justice. On the other end of the spectrum is Vinod, who turns daku vigilante/avenging angel after his father is brutally murdered. 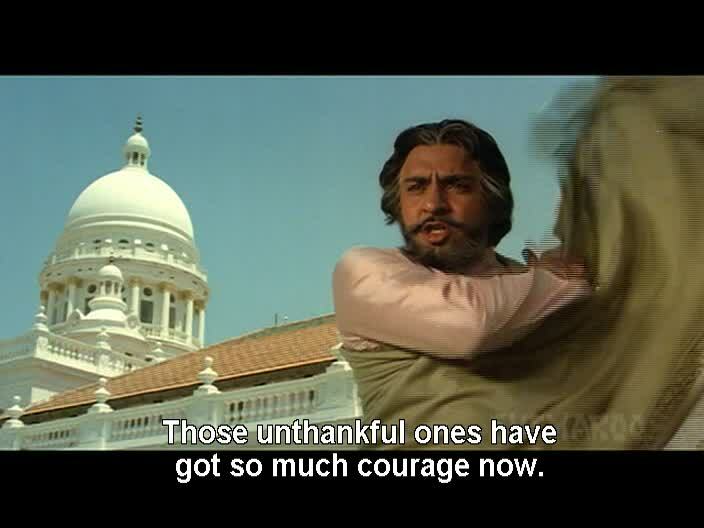 Speaking as a Vinod fan, this is a brilliant bit of casting because we get to enjoy him snarling and sweaty and root for him unabashedly because the only people he harms absolutely deserve it. He also keeps his soft lovey-dovey side, doing his best to protect and support Ranjeeta. 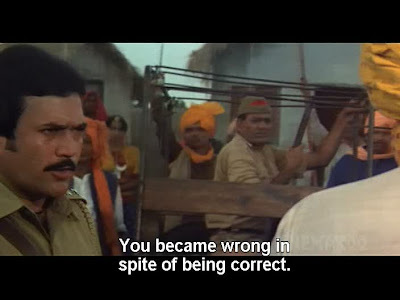 Between them ideologically and pragmatically is Dharmendra, who acts with hot Rajput blood but also submits to and works within the police system and eventually unites both brands of justice to defeat Ranjeet. we are constantly reminded of the his inability to fit into the new world. He also has a few good characteristics centered around the next generation: he genuinely loves his offspring (most importantly daughter Tina, who of course falls in love with Vinod), including encouraging their education, which I think helps emphasize his interest, however misguided, in continuing the family line and traditions. He is a self-centered and immoral person like so many other villains, but I think in this case he can be read as floundering as well. He's trying to hold on to something that used to be honorable; unfortunately he's too weak to do so in a constructive or empathetic way. There are many other interesting threads in this movie but I couldn't figure out how to talk about them without spoiling the plot. One that particularly grabbed me is how the women fare. There are four female characters in this film with any substantial dialogue, and like the men none of them has what could be called a happy story. The only female member of the older generation, Indrani, shows that even years ago people were caught between tradition and modernity. She chose to get married against her family's wishes, and she suffered from their hatred of her so much that she seems miserable in later life. But she herself is loved greatly by others, particular Dharmendra and Vinod, who seem to treat her as a maa stand-in, and there is a heart-wrenching scene of Vinod crying with his hand pressed to the window of an ambulance as it takes her to the hospital. Tina, the youngest woman, also gets to make up her own mind about her role in this society and eventually decides her father's path is wrong and joins the heroes. Hema and Ranjeeta have more complicated situations that uneasily combine family pressures, traditions, and choice and leave them with illegitimate children...for which they are never judged and out of which the film creates viable, loving families. I wonder if Hema might even represent a sort of contemporary Mother India, devoted to her child and doing her duty but also acknowledging that her past and the lives of the people around her are not perfect or simple. 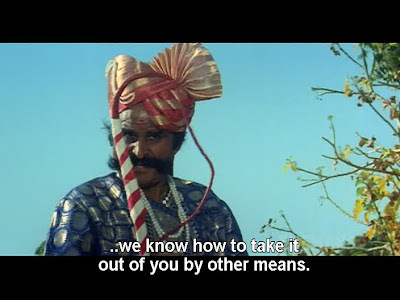 There's even a nameless village woman who defiantly throws a rock at one of Ranjeet's men. None of the women in this film is simple and all of them show strength of various kinds contextualized in their situations. I loved it! Rajput is the kind of film unafraid to leave things uncertain. As a viewer who most loves the solid ground of Masala Pradesh under her feet, that can be a little frustrating, but it absolutely makes sense in the story. These people have work - including healing and bridging - to do if they're going to succeed. It seems that the alliance between Rajputs and the ways of the larger society is successful (for now) but still fragile. 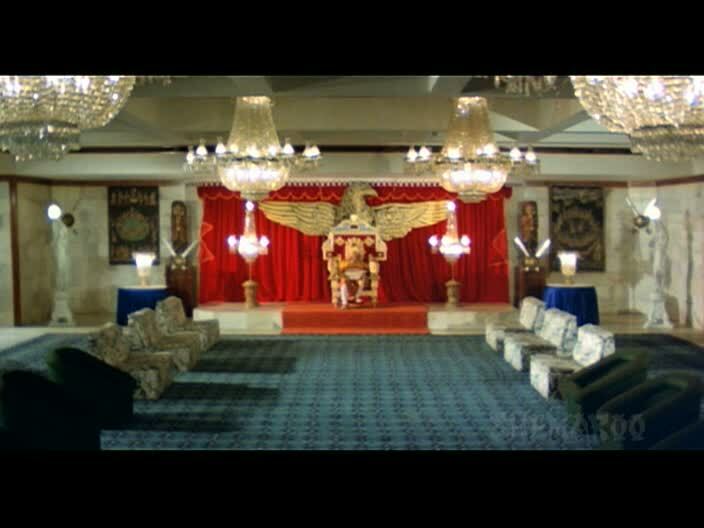 I think the film works well enough as a daku-drama, supported with beautiful Lakmikant-Pyarelal music and great performances from everyone, but there is a lot more in it if you give its ideas room to grow in your mind. For more on Rajput, see Nicki's post from Khanna-o-Rama in 2010. At the beginning I was going to ask: "Where did you find this film? ", but ok, then you wrote that Dharmendra was in it. I'm not one of those Dharmendra-fanatics, though I appreciate his films and think he's a good actor, but obviously I had never heard of this film. WAPOH! I totally ordered this as SOON as you mentioned it on Twitter, because, COME ON. WAPOH! 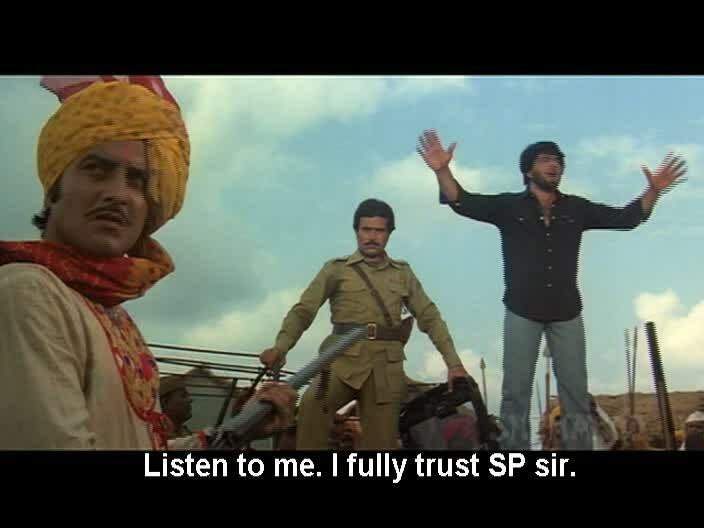 I have a bunch of films with the glorious brodi waPOWER of HPK and Dharam together that I just have not had the time to get to this month...but that means I have plenty of treats waiting for me. This comment is so unconstructive, but it's because basically Vinod and Dharam together WAPOW! WAPOH! melt my brain. (Rishi somewhere is making the appropriate sound effect on his HKKN trumpet). I'm with Lime(ette): my new favorite line/sub of all time has got to be "I am not out of my mind. I am a Rajput." Wonderful review Beth. I have GOT TO SEE THIS NOW. Had been putting it off (the vintage, fear of disappointment, what have you) but no longer! "Bhagi Re Bhagi Brij Bala" is a wonderful number. Hema, Dharmendra, Vinod, and the lovely Ranjeeta Kaur (a name new to me), plus long continuous takes, a multilevel set, and Holi--pure bliss! Like you I'm amazed that this song hasn't become a Holi classic. 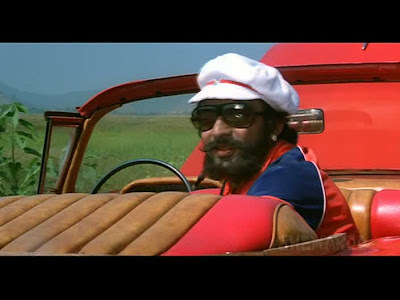 Ness - Rishi would have been so busy in this film! I think you'll find this one really interesting and I will eagerly await reading! memsaab - Totally :) I so hope the film lives up to your expectations now! Eee! It also had several ALMOST paagal subtitles that were not QUITE paagal enough to merit being in the tumblr, but I have faith you will enjoy them as much as I did. Pessimisissimo - Oooh I hadn't even thought about the set, but your'e right, it's pretty and elaborate - and the takes! Yes! What a great song! You made me smile with the Wapoh definition :) They ARE a darned good looking pair of men, aren't they? I have not heard of this Rajesh-Vinod-Dharam starrer; I will watch it just for interest as to how the chemistry works between these three men. Very nicely done. It’s so refreshing to see reviews of films from the lens of the films themselves rather than what had been their fate at the box office (this one flopped I understand), which star got his/her comeuppance in the multistarrer according to the rags that folks swear by now as having total credibility :-D, etc., etc. I saw this (but of course) for Rajesh :-) and oh how I LOVED him in this! As always, the subtitles are a huge letdown—so much nuance missed e.g., Rajesh’s vow a la Bhishma’s in the Mahabharata, Hema’s name Janki and Dharam’s reference to it at the end of the film, etc. 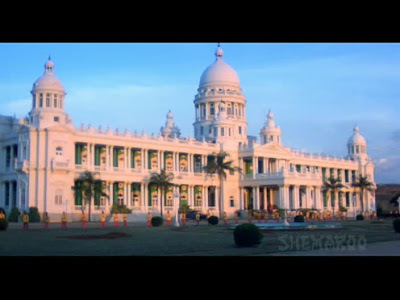 Vijay Anand is a pastmaster at song picturization—‘Mere sang sang ’ is wonderful in that regard. Suja - Isn't it GREAT? Ness came up with the phrase, clever one that she is! I think the heroes all worked very well together here. A lot of that is because of the script, I think, so I have no idea how they would do in other settings. Certainly worth a gamble! I thought Rajesh was really good in this. I've only seen a few of his films and I'd say this is my favorite of his performances so far. Interesting about the subs - I operate with an assumption that I'm missing things, but those are some key ones! 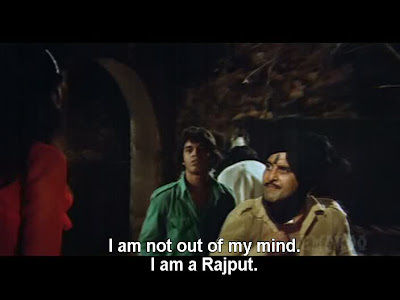 My last viewing of 'Rajput' was while I had the flu. But your review makes me want to see it again. I saw the movie when I was a kid, now i think its funny. 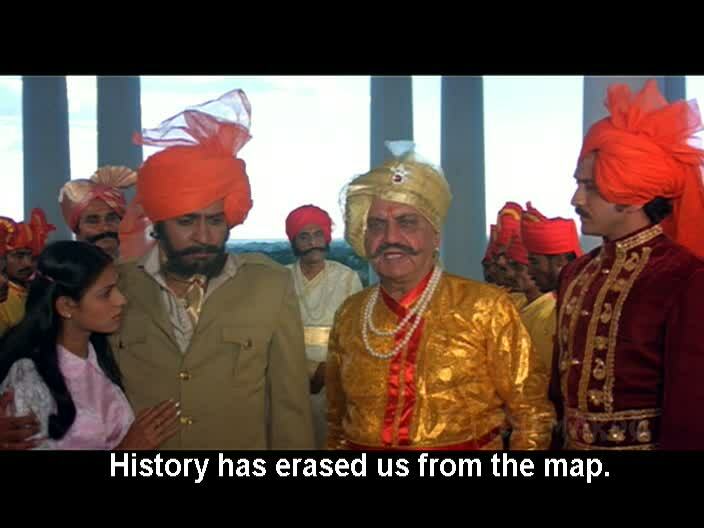 Rajput what a movie, i have seen that so many times. Some great things make this movie great like it's star cast and songs. I like that song "kahaniya sunati hai" and "mere sang sang aaya". I think it was really a realistic story of the time when most of the kings are fighting for their kingdoms. Anyways thanks for such a nice movie.